Light Emitting Diodes (LEDs) are another form of light therapy that is a relatively recent development of the laser industry, LEDs are similar to lasers in as much as they have the same healing effects but direr in the way that the light energy is delivered. LED disperses over a greater surface area these results in a faster treatment time for agiven area than other light therapy. LED only generates the low power level energy for photo-stimulation on afflicted cell tissue. No side effect and most safe LED becomes the most popular light therapy in the world, best for all kind of skin problem, pain relief, photo-rejuvenation, firming, whitening, and pigmentation. • Reduces the overall redness flushing and dilated capillaries of Rosacea and improves the recovery from these common chronic facial disorders. 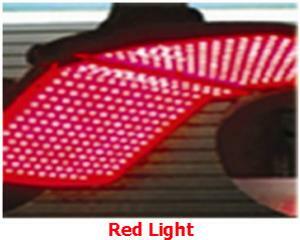 LED light is a kind of natural therapy which is the most advanced technology for cell repair mechanisms. Light energy will be absorbed by underneath skin and stimulate cell activity and metabolism, relieve muscle tension and accelerate the recovery time then purge bodily toxins and mineral water out from the body and allow the rate of blood flow and bring more nutrients and vitamin to the whole body. 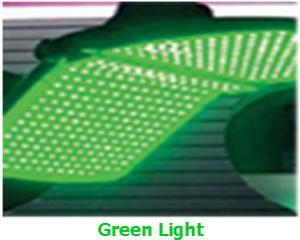 LED use the Monochromatic Single-Wavelength stimulate cell to undergo the process of Bio-Stimulation just same as the concept of plant photosynthesis (plants use chlorophyll to convert sunlight into cellular building blocks). LED can help to increase the body cell growth rate for 5 times Experience shows that light can stimulate mitochondrial ATP directly, assign more energy produce from mitochondrial finally accelerate recovery mechanism and repair the tissue reduce the recovery time. Stimulate the production of collagen is the essential protein used to repair damaged tissue and to replace old tissue. Best for fine lines; reduce pore size, swollen after surgery. Acne bacteria contains porphyrins the blue light is able to kill porphyrins due to the high affinity with this wavelength. 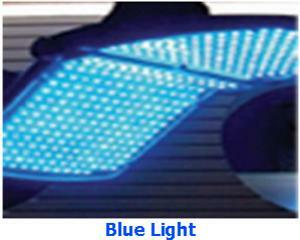 The blue light furthermore has a calming action resulting effective on hypersensitivity. Green symbolizes the harmonic cycles of nature and it is the main healing color it is used primarily for wrinkles and aged skin reduces fine lines, nourishes skin, promotes the healing process and smoothen scars. 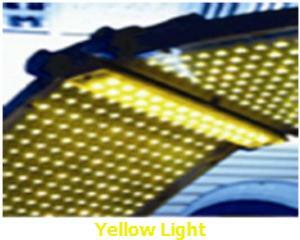 Yellow is a warm color that can stimulate both the lymphatic and the nervous systems. It is used to tone muscles and to boost immune system and furthermore helps to relax and restore the sensitive skins balance.